about the travel Myvillages.org presented their fresh-made BBBox for the first time in the context of TRADE, organized by The Dock in Carrick-on-Shannon, County Leitrim, Ireland. 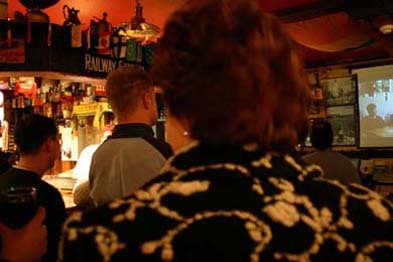 The launch was in a pub. 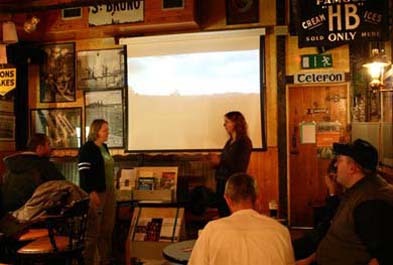 On Thursday 23rd November 2005 at 10 p.m. - in cooperation with our first host Manus Mc Manus - a presentation in Gunnings, a pub in the village Drumshanbo, was the box’s first public moment. Drumshanbo is mostly known for its big marts selling cattle and sheep midweek. Drumshanbo is the Irish word for: the hill of the old cow. Manus McManus is a native of Drumshanbo, his grandparents and parents owned a pub on the opposite side of the high street for many years, wich has now been converted into a chemists. He introduced us to the owner of Gunnings. We were introduced to Manus by Anna Marie O’Rourke from Visual Leitrim. After a short introduction by Wapke Feenstra and Antje Schiffers, the smell of the Dutch perfume ‘L’Essence de Mastenbroek’ dominated the pub air for a second. The video film “A village does nothing” by Elisabeth Schimana and Markus Seidl was shown on the big screen, a screen where they tend to look at soccer games. This evening the Austrian Village Eberhardschlag was on show and after the film the Irish public drank a Guinness with us and shared stories about Ireland and taking holidays. After eleven all guests were locked in. TRADE invited artists’ agencies to exhibit work and documentation on their projects, and asked delegates to share perspectives on their practice via formal exchange sessions and on a one-to-one basis. In addition to myvillages.org, N55 (Denmark), 16beaver (New York), General Public Agency (UK), M&M proyectos (Puerto Rico) and Catalysts Arts (Belfast) participated in this event which combined exhibitions with a seminar including presentations, exchange sessions and workshops. Underlying the open nature of the event was an aspiration to generate ideas and thinking around sustaining alternative artistic practices which are concerned with a connection to place and an active engagement with contemporary socio-political and cultural scenes. 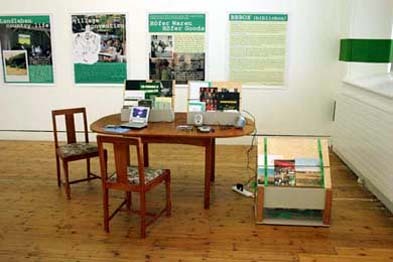 Besides 5 project posters, myvillages.org presented the BBBox in the exhibition room on a brown dining-table and used that to host the one-to-one sessions with the audience during the seminar. Myvillages.org was represented by artists Wapke Feenstra and Antje Schiffers. In the seminar they screened a part of “Stop Shop” by Amy Plant. 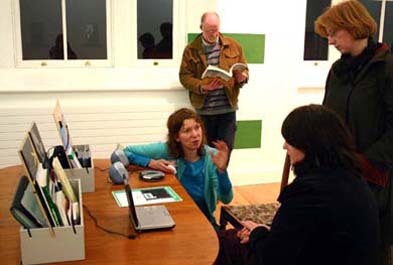 about the host TRADE was open to the audience from 25th November till 3rd December 2005, and developed by Cliodhna Shaffrey (curator), arts officers Philip Delamere and Caoimhín Corrigan, and Anna Marie O’Rourke from Visual Leitrim. Myvillages.org thanks these hosts for their invitation and especially for giving us the opportunity to exchange ideas with colleagues and supporting our BBBox-pilot.